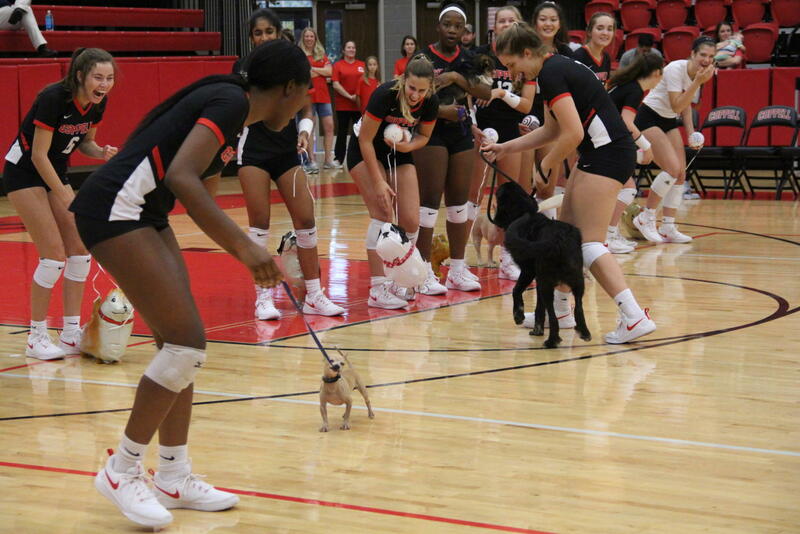 Coppell High School senior Amarachi Osuji walks across the court with Operation Kindness chihuahua. All profits from the Dig for Dogs volleyball game on September 18th will go to Operation Kindness, a no kill shelter located in Carrollton. Coppell High School’s volleyball team is a rare breed of team immersed in a culture of giving their all: on and off the court. Hosting events such as Digs for Dogs has earned it a charitable reputation. On Tuesday night, the team continued their philosophy with the Digs for Dogs event. This event is part of a yearly tradition of having a Philanthropy Night to support a player-chosen charity. 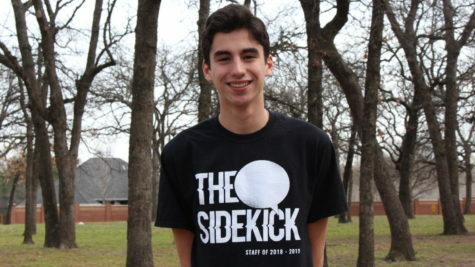 The event was a fundraiser for Operation Kindness, the oldest and largest no-kill animal shelter in North Texas. Before the start of the match, the entrance of the arena bustled with parent volunteers and Operation Kindness workers. Booths selling T-shirts were complemented by tables lined with baked goods such as home baked cookies, brownies and pastries. Six dogs in need of a home strolled throughout the set up, graciously receiving belly-rubs and engaging in brisk games of fetch with students who walked by. Those dogs were later presented alongside the players at the beginning of the game. All proceeds from the event will be donated to Operation Kindness so that they may continue to try to find a home for their animals while making their experience as pleasant as possible. Donations help make actions such as these possible. The money raised is making a difference for dogs such as Ellis, the Australian shepherd that remained by Philips’s side. Coppell volleyball coach Julie Price finds making these personal connections and finding opportunities to give to be essential. “[Our team culture] is about teamwork and character, taking care of others and learning to serve,” said Price. “In the end, volleyball is going to be gone and these young ladies are going to go out and win the day and make a difference”. An act of service can truly make a difference in the lives of others, both for humans and canines in a rough spot.